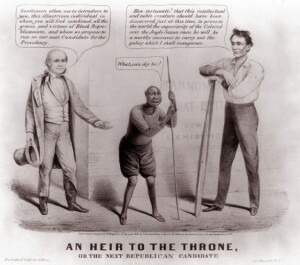 Though the caricature of Lincoln made what would have been, an outrageous statement on the hierarchy of the races, the subject of his assertion—the black man—was still labeled as a “creature.” Maurer actually borrowed this image of a black man from P.T. Barnum’s American Museum exhibit “What is it?” Barnum advertised the exhibit, which ran in New York in 1860, as the link between human beings and monkeys. An announcement that ran in the March 1, 1860 edition of the New York Tribune attempted to draw in spectators with the attention-grabbing questions: “Is it a lower order of man? or is it a higher development of the monkey? or Is it both in combination?” The question of race, and of slavery, was on the forefront of Americans’ minds in 1860, adding to the relevance of Barnum’s exhibit. In addition, Charles Darwin published his ground-breaking scientific work, On the Origin of Species by Means of Natural Selection: Or the Preservation of Favoured Races in the Struggle for Life, only months before on November 24, 1859 in London.